I wish my lecture notes looked this good! 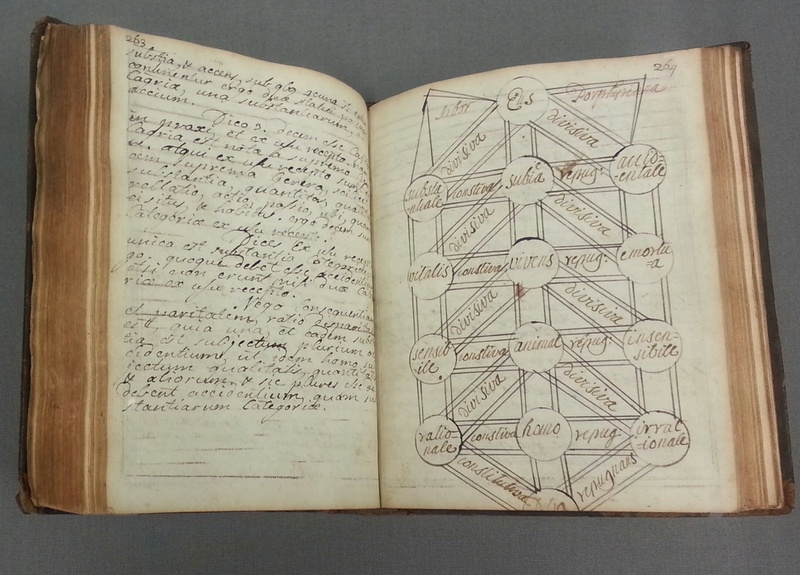 This notebook relating to philosophy studies is from the Irish College in Salamanca. It is signed by Richardus Lincolne [Richard Lincoln] and dated 1722. Lincoln went on to become the Archbishop of Dublin. The diagram on the right hand page is a Tree of Porphyry: a series of definitions outlined in diagrammatic form. A more modern version of the diagram is here; more on Porphyry’s tree (“The Earliest Metaphorical Tree of Knowledge”) here. From Irish Students in Europe: celebrating 350 years of scholarship through the collections of St. Patrick’s College, Maynooth and NUI Maynooth, a small exhibition of notebooks (17th and 18th century; one each from Paris, Louvain, Glasgow, Salamanca and Seville, all from the Maynooth archives) and secondary literature relating to Irish students in Europe. The exhibition is on in the John Paul II Library in Maynooth and is open to the 21st June. Toland was not as facile and unoriginal as many detractors alleged. Indeed his more significant writings, such as his “Letters to Serena”, “Adeisdaemon”, “Origines Judicae”, and his astounding quasi-theological project, the “Nazarenus” (1718), in which he seeks to dechristianize Christianity and remodel it as a republican civic religion designed only to teach the common people morality, demonstrate his original, creative side and some depth. Moreover, he had an exceptionally strong consciousness of the public sphere and the need, on republican grounds, not just for an ‘entire library of conscience’ but a robustly constructed civic religion based on a ‘purified Christianity’ (i.e. dechristianized civic religion) which would provide political society with ‘rules for virtue and religion’. His contribution to the development of the Radical Enlightenment was in fact rather substantial. From Radical Enlightenment: Philosophy and the Making of Modernity, by Jonathan I. Israel. The first paragraph is taken from page 610, the second from page 613. Double quotes replace the italics in the original text. The following year William Thompson and Anna Doyle Wheeler jointly authored An Appeal Of One Half Of The Human Race, Women, Against the Pretensions of the Other Half, Men” (published under Thompson’s name). Anna Doyle Wheeler and William Thompson both knew Bentham and were interested in utilitarianism. An Appeal expresses dismay at the cavalier treatment Mill gives to women’s interests and systematically demolishes Mill’s argument in On Government by appealing to the same utilitarian principles that Mill uses. Ought Tolstoy Have Been Cured? There is an amusing but I think significant story which Ernest Jones records about Freud. At the time when the relations between Freud and Jung were almost at breaking point, Jung was still secretary of the psycho-analytical association. He sent Jones an announcement of the next meeting but made an error in the date, so that if Jones had not had other information he would have missed the meeting entirely. Jones knowing Freud’s interest in these slips of the pen and tongue showed the letter to him. But Freud was neither interested nor amused. No gentleman, he said, ought to have an unconscious like that. Quote from The Danger of Words, by Maurice O’Connor Drury. In this essay, “Madness and Religion”, Drury reflects on some patients he has treated. In the past some with similar experiences became religious leaders or writers such as Leo Tolstoy. Would it have been right to have cured Leo Tolstoy? Is that a question a psychiatrist should ask? Drury reflects on this philosophical and ethical dilemma, arguing that defining religion as “racial psychosis” ignores the ethical aspect. Also note the echo of Kant in the last two lines. Some books (like Hume’s Treatise) fall “stillborn from the press”, as Hume put it. A small number of those (eg. Hume’s Treatise) are rescued from oblivion by later readers. Other books have the opposite fate – they are widely read and discussed only to fall into obscurity. One such is De Origine Mali (1702), by William King, Archbishop of Dublin, later translated by Edmund Law as Essay on the Origin of Evil (1731). “The most rigorous effort to construct a rational theodicy in this period appears in the closely related work of Leibniz and William King”(Mephistopheles: The Devil in the Modern World, p. 84) Both philosophers were answering Pierre Bayle, who had come to the conclusion that no solution was possible which reconciled the evil of the world and the existence of a perfectly good and all-powerful God (SEP). Their works were highly influential. Yes; there are suggestive things in Individualism. Socialism annihilates family life, for instance. With the abolition of private property, marriage in its present form must disappear. This is part of the programme. Individualism accepts this and makes it fine. It converts the abolition of legal restraint into a form of freedom that will help the full development of personality, and make the love of man and woman more wonderful, more beautiful, and more ennobling. Jesus knew this. He rejected the claims of family life, although they existed in his day and community in a very marked form. ‘Who is my mother? Who are my brothers?’ he said, when he was told that they wished to speak to him. When one of his followers asked leave to go and bury his father, ‘Let the dead bury the dead,’ was his terrible answer. He would allow no claim whatsoever to be made on personality. This essay is full of optimism for the future, and as Thomas Duddy says in A History of Irish Thought, this makes it poignant reading for modern readers. Oscar Wilde foresees a future socialist and individualist utopia of a rather idiosyncratic kind. Wilde rejects collectivism, seeing the abolition of private property and marriage as allowing the atomisation of society, allowing unfettered development of the individual. This episode of philosophybites features Richard Bourke of Queen Mary, London University, putting Edmund Burke into his historical context and outlining his key ideas. More here including abstracts of articles by Richard Bourke on Edmund Burke. Particularly interesting are his comments towards the end of the nine minutes on where Burke was shown empirically to be wrong, and on where Burke is relevant today. From Hegel’s Lectures on the History of Philosophy: Part Two. Philosophy of the Middle Ages. This second section covers The Scholastic Philosophy. The entire lecture, including an unabridged version of the quote above is available here. When I say that Iris Murdoch’s novels are philosophy, then, my claim has very little to do with the fact that her characters sometimes talk about Wittgenstein or quote Heidegger or Kant or go to dinner with Oxford philosophers, or that she makes philosophical jokes (‘There are some parts of London which are necessary and others which are contingent’). […] What her novels systematically embody is a theory about theories, a theory which is to some degree against all theory – including itself. And if this does not entail that she had to be a novelist, it is at least clear that such a point of view could never have received adequate expression merely at the level of theory. From Good for nothing by Alasdair MacIntyre in the LRB (£ to read full article).